I was given the Heat Transfer Vinyl to create this shirt. All opinions and instructions are my own. Frozen fever is still alive and well in our house. Not a day goes by that someone doesn’t belt out Let It Go and my 5-year-old’s Elsa and Anna dolls are pretty much a fixture, while the Hans doll ends up in a makeshift prison. 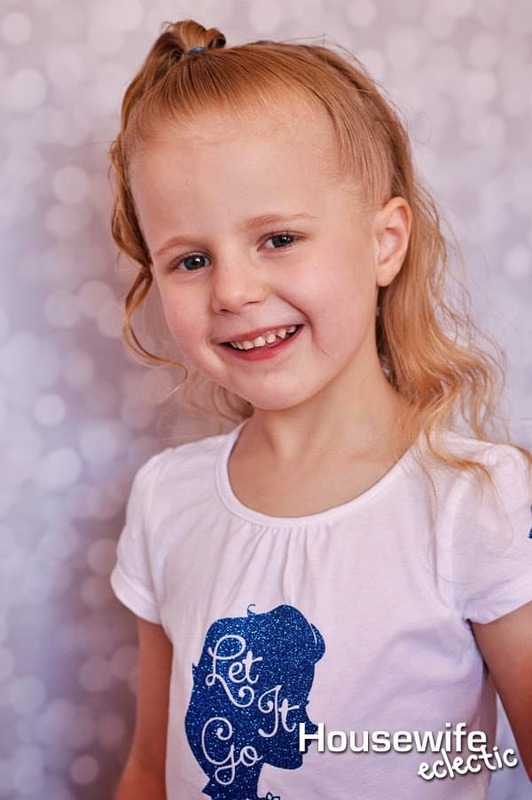 From the second we saw the movie, my daughter has been asking for an Elsa shirt and not just any Elsa shirt, a sparkly one. Glitter heat transfer was the perfect medium for this shirt, it made everything really easy to pull together and kept it looking so good that when she wore it to the Disney store, one of the employees asked where I found it in the store. Remember when cutting heat transfer with a machine, you always need to be sure to flip/mirror your images or you text will be backwards when you iron it on. Feed your glitter heat transfer into the machine with the carrier (clear plastic sheet) down. The settings you need vary from machine to machine. For a Silhouette Cameo you will need, a speed of 8, a thickness of 9 and a blade setting of 2. For all other machines, go here for each machine’s individual glitter settings. Cut the glitter heat transfer and the weed out the extra. Preheat your shirt or other surface for about 3 seconds with a iron set at 325 degrees. Place the main design glitter side down on the shirt. Apply firm pressure on ALL parts of the design for 10-15 seconds. Flip the shirt inside out and apply heat and pressure on the design from the inside as well. Peel the clear carrier sheet off while the design is still hot. Repeat the process with the snowflakes on the sleeves of the shirt. You can find video instructions for cutting and applying heat transfer here. One of the things I love about this glitter heat transfer is that it doesn’t require hand washing. Simply flip the shirt inside out when washing and then hang to dry and your shirt will last for a long time. You can find the file to make this shirt here. All files are for personal use only, when sharing please direct people to the post on Housewife Eclectic. Expressions Vinyl has generously offered to give all Housewife Eclectic readers 10% of their purchase by using the code HOUSEWIFEECLECTIC at check out. Who is the Elsa fan in your life? How cute is that! the shirt looks like allot of fun and she looks like she loves it! That is such a cute shirt. I have a niece that would totally rock one of those. I am sending this to my sister. My niece is obsessed with Elsa and Frozen! Very cute shirt, my daughter loves Frozen and would like this shirt a lot. That is SO adorable. I bet a lot of little girls would love to rock that shirt. My daughter is FROZEN obsessed and would love this! Love it! Is there anyway you can post a jpg or svg for those of us with Cricut Explores? Thanks! How cute. My daughter would love this so much. That is so adorable! My daughter would flip. I can see going wild with this and letting the kids add as many snowflakes as they want. And you don't have to fight the crowds at the store. so cute! I love this. I need to see the movie! Every little girl would just absolutely love this! This is so precious! My daughter would love it. I'm a fan of anything with glitter. This is just darling! That is adorable. I made some cardinal ones for my daughters cheer team once but not nearly as nice as your work!! Great job, everyone loves Frozen! Love the glitter! Great job! I want to make this so badly with Expressions Glitter HTV, but don't have Studio – I have a Cricut with SCAL2. Do you have an SVG or JPG of the file? You are AMAZING. My 4 year old is frozen OBSESSED (what little girl isn't?) She's going to LOVE this!! Thanks a million! My girls can't get enough of Frozen and will now love me forever! My daughter loves hers. Thank you so much! Any chance you can let me know what font this is? Thank you soooo much for the free design and info on settings! I just made the shirt for my granddaughter and I'm sure she is going to love it! Being a new Silhouette owner, it took me a little longer to get it cut & weeded, but it was well worth it! 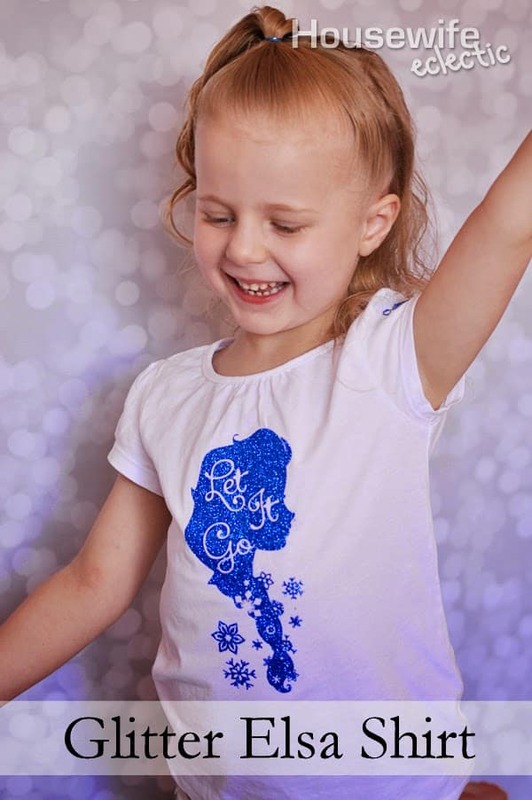 She love Elsa & Anna, so even though it's not quite "frozen" out, I think she will get a lot of wear out of her new tee! Thank you again! Looks really great! I will surprise my daughter with such a cool ELSA frozen Shirt! Thanks for your freebie!